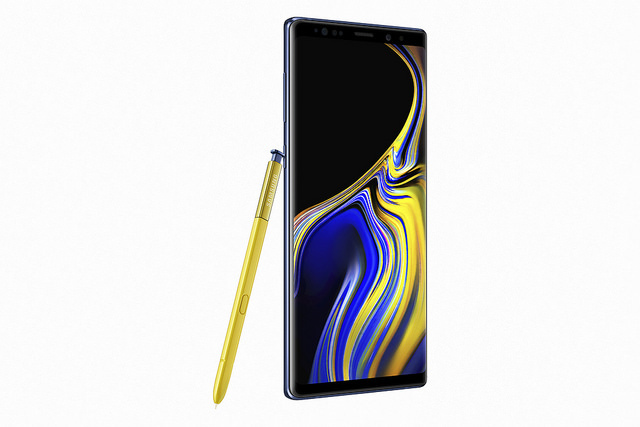 Galaxy Note9 Is Here With 6.4" QHD+ Super AMOLED Display, 4000mAh Battery, More Powerful S Pen & More - AndroGuider | One Stop For The Techy You! 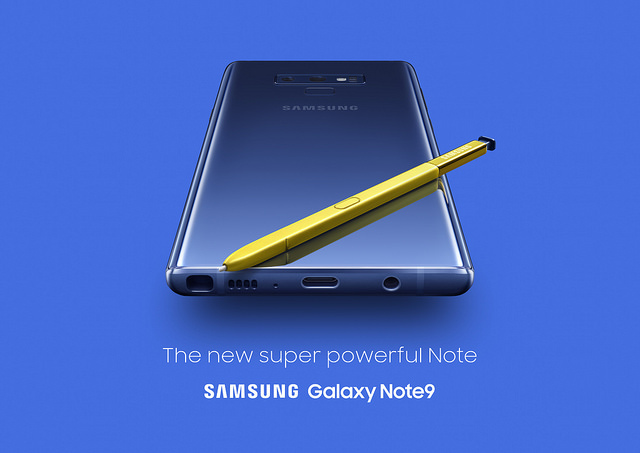 Samsung has just made the Galaxy Note9 official. The phone, like the Galaxy S9, is an incremental upgrade over its predecessor. The processor has been upgraded to Snapdragon 845 for US/China (or Exynos 9810 in other regions), the RAM has been bumped to 6GB/8GB, there is a taller 6.4" Super AMOLED QHD+ (2960x1440) screen with 18.5:9 aspect ratio and the battery capacity has been increased to 4000mAh. As can be expected from a sizeable battery, Samsung claims that the Note9 will last an entire day on a single charge. The GN9 packs in two cameras at the back: the primary shooter is a 12MP wide-angle sensor with dual aperture (f/1.5 and f/2.4) and the secondary snapper is a 12MP telephoto sensor with a fixed f/2.4 aperture. Both the rear cameras feature OIS. Samsung says that the GN9 uses AI for identifying the scene and then optimizes the image colours accordingly. There is also a 'Flaw Detection' mode to alert you if someone blinked while the photo was being taken or if the camera lens is dirty. The selfie camera has an 8MP sensor with f/1.7 aperture. The S Pen is the signature feature of the Galaxy Note series, and with the Note9, the S Pen has become better than ever. The stylus now features wireless charging and Bluetooth Low Energy technologies. The use of Bluetooth makes the S Pen much more capable than the standard writing and note-taking tasks. There are a lot of use case scenarios: you can use the S Pen as a shutter button for taking pictures, it can be your slide clicker for presentations and you can use it to play or pause any media playing app. I can think of the S Pen being very useful while taking a group selfie. The person at the end can stretch their hand the farthest, while someone else can press the shutter button to snap the selfie. The S Pen comes with its own battery that can recharge itself in under a minute (obviously, the stylus has to be in the phone for its battery to recharge). The standby time is either 30 minutes or 200 clicks. Unlike the Bixby button, the button on the S Pen can be programmed to open any app. By default, a long press of the button will open the camera app. Samsung says that it will release an SDK for developers later in the year so that they can take advantage of the button on the S Pen. Other than the dual cameras at the back, the Note9 borrows a few more leaves from the Galaxy S9. The earpiece doubles up as the stereo speaker, there is a heart rate sensor and an iris scanner. The fingerprint scanner has been relocated below the camera module, but given the tall frame of the phone, it may still be hard to reach. Another highlight of the Galaxy Note 9 is its DeX software. 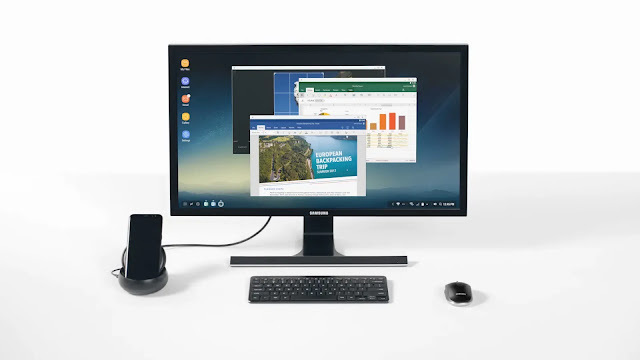 Samsung DeX makes it possible to use the Note9 as a desktop. The Note9 can be plugged into an external display using an HDMI adapter. Once that's done, Samsung DeX will load up on the external display, and the screen of the phone can be used as a trackpad or for typing text using the virtual keyboard. By simplifying the connectivity, Samsung has made DeX lot more usable for frequent travellers. For the time being, the Galaxy Note9 is one of the few phones that will be able to run Fortnite. However, Samsung's exclusivity deal with Fortnite will end well before the Note9 hits the market. Samsung knows about this and it has some pre-order offers which might pull Fortnite fans into buying the phone. Those who pre-order the Note9 can choose to get either the AKG noise-cancelling headphones (worth $299) or the Fornite Galaxy skin along with 15,000 V-bucks (worth $150). The pre-orders page will go live on August 10. To make it more pleasant for users to game on the Note9, Samsung has included a "water carbon cooling" system. Samsung says that this will allow for long gaming sessions on the phone without any heating issues. The flash storage on the Galaxy Note9 has been doubled from its predecessor. The 128GB variant of the Note9 comes with 6GB RAM for $999. There's also a more expensive 512GB storage option with 8GB RAM for $1,250. The phone has support for microSD cards up to 512GB, so you can get over a terabyte of storage space if you buy the higher model and a 512GB microSD card. Unless you really need that extra 384GB storage, go for the base model.